The blade is of hardened steel that shines as silver but that glows orange in the presence of LEY LINES. The Hilt is decorated in the scarlet and violet colours of the vanquished house of VAIRN CONSTIAIN, and is sprinkled with sapphires around a dragon head pommel. The wielder gains a +2 circumstance bonus to CMD whenever an enemy attempts to sunder and, although it isn’t a light weapon, the wielder may utilize Weapon Finesse to apply a DEXTERITY modifier instead of a STRENGTH modifier to attack rolls. 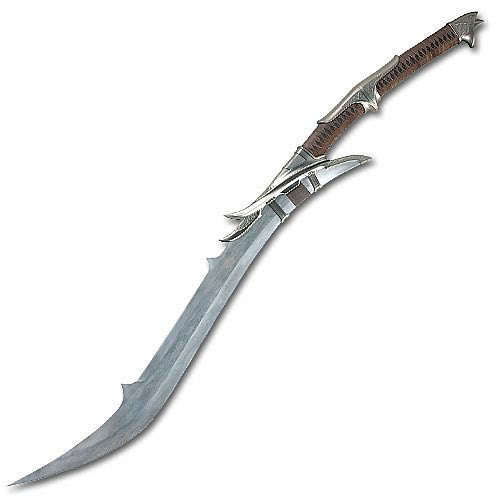 The Elven Curve Blade of Vairn Constiaine was most undoubtedly made by ancient Elven craftsmen and although its exact lineage is uncertain, Falathar has been told by his elders that it has felled many enemies and even slain a dragon. In the vicinity of one mile from any LEYLINE, the normally silver metal of the blade glows with an orange glow. At any time on confirmation of a CRITICAL HIT, the blade glows red for an instant and delivers 1 point of BLEED damage to the opponent in addition to normal damage dealt. This BLEED damage carries on every round until either magically healed or stopped by a DC12 HEAL CHECK. Creatures immune to critical hits are immune to this effect.